Find answers to common questions about composite decking, railing, and fencing. What does the term "multi-chromatic" mean? Multi-chromatic is a term used to describe the varied light and dark streaking on certain composite decking. By adding different colors at precise moments during the manufacturing process, we are able to create a more nuanced color palette on a single board – something you might also call multi-dimensional color. How do I remove the label adhesive from my Fiberon deck Boards? When you remove the labels that come standard on our deck boards, there may be some adhesive left behind. We recommend WD40, denatured alcohol or PVC pipe cleaning liquid as the most effective means of removing this adhesive. Traditional deck cleaner or power washing may not remove the adhesive completely. I accidentally chipped a piece of my deck board. Is there a way to repair it? While Fiberon decking is resilient, some outside sources can damage it. Certain minor issues can be fixed with a brass bristle brush or heat gun. Or, since Horizon Decking is reversible, you may opt to remove the chipped board, flip it over, and re-install it. If you’re not sure what the best course of action is for your particular situation, we recommend contacting our Technical Services staff via email. What cleaner is best to use to keep my composite railing like new? To clean your composite railing and maintain its like-new appearance, we recommend using Fantastik®, Mr. Clean® Magic Erasers or DeckMax PVC Revitalizing Wipes. Can I get product samples? Yes, you can easily order samples of Fiberon decking, railing, fencing, and fastener material through the Fiberon online store. Viewing samples at home allows you to test the product quality, as well as match colors and styles before you buy. Most samples are just $5 and include free shipping. Proof(s) of purchase, detailing lengths and quantities, from the retailer where the material was purchased. Please note: We CANNOT accept a contractor bill/invoice or credit card statement as proof of purchase. Detailed photos of the material in question, including ones that show how the material was installed. Also, please include at least one photo taken from a distance that shows the entire deck project from the ground level up. Mail or email the claim form, proof(s) of purchase, and photographs to Fiberon. Due to the tight spam filters on our servers, please limit email sizes to 6MB or less per email; however, you may send as many emails as needed. Your claim will be evaluated upon receipt of all the above requested information. Keep in mind that we may request additional information and/or photographs at a later date. What makes Fiberon Decking and Railing safe for my home? Fiberon products are urea formaldehyde-free and manufactured without toxic chemicals. Products installed according to our manufacturer's instructions and local building codes provide sturdy decking and surrounds that do not splinter, crack or decay, protecting workers and users from potential injuries. How do Fiberon products produce less waste during installation? Fiberon products provide unique features that help contractors reduce waste by up to 15 percent per job. Grooved and square edge boards come in a variety of lengths so contractors will have to cut fewer boards to fit, creating less scrap. Boards that are reversible have usable surfaces on both sides. This reduces the number of cuts needed, thereby eliminating waste. How much ventilation is required under a deck? It is very important that there be adequate and unobstructed air flow under the deck to prevent excessive water absorption. Improve drainage or grade flat areas where standing water may gather. For decks with limited ventilation, six inches of clear ventilation is required. Will heat from cooking grills or fire pits harm Fiberon Decking? Not usually, but some composites do stain from dripping grease. Place a vinyl-backed splatter guard mat underneath your grill. Fire features and fire pits are increasingly popular in outdoor living environments. Fire can damage many building products, including Fiberon decking. Improperly installed fire features and fire pits can cause damage to the surface of Fiberon decking via direct exposure to the flame or excessive radiated heat. Proper caution should be taken when designing, installing and using these features to ensure damage does not result. What if my decking gets scratched? In the same way that wood decking materials can get marred or gouged, the surface of composite decking can also be scratched. Horizon Decking and ProTect Advantage are the Fiberon products most resistant to scratches. If scratches do occur, we recommend allowing normal wear marks to disappear gradually. Will salt water hurt Fiberon products? Salt water splash has not been found to be detrimental. Are Fiberon products slippery when wet? Slip resistance testing under ASTM methods conducted by Fiberon on Fiberon manufactured capped decking products met or exceeded the recommendations of OSHA. An average of both dry and wet conditions was used in the testing evaluation and resulted in coefficient of friction (COF) averages of .50 or higher. All capped decking products manufactured by Fiberon have a micro-texture pattern in the surface embossing to increase slip resistance. Fiberon Paramount Decking has a high slip resistance when tested according to ASTM F 1679 with a dry/wet rating of .85/.82. Although there are specified ASTM methods of measuring slip resistance, there is currently no building code requirement for minimum slip resistance. Methods used to test the relationship of the foot to the surface material measure the slip resistance to lateral movement caused by contact between two surfaces. Slip-resistance tests that are correctly performed under different consensus standards may produce different results. Variables that affect slip resistance include, shoe tread, stride, speed of stride, debris on surface, amount of moisture present and weight. What is a multi-chromatic surface? Unlike other decking boards that use shadows from embossed or molded surfaces, Fiberon products are developed with a proprietary process that injects more vibrant hues into the board to create the rich, natural color variation found in real wood such as cedar, redwood, and ipe. Do Fiberon products require water sealing? No. Fiberon products require only periodic cleaning with soap and water. Deck sealants are not required or recommended. What is the significance of using HDPE to make Fiberon decking? High Density Polyethylene (HDPE) provides superior physical and mechanical performance as compared to mixed density resins. HDPE resins are typically found in more rigid products like drinking cups and food packaging. The use of HDPE results in a decking board that is stiffer, more durable and much harder than other decks made with inferior grades of plastic. How can I prevent mold from growing on my deck? To minimize mold on the decking, clean the deck as often as needed but at least twice each year. Climate conditions vary in different regions of the country and may necessitate more periodic cleaning. In some situations, you may need to repeat the cleaning process multiple times until you are no longer able to see any “shadows” of the spots on your deck while it is wet. You would also want to apply a mold inhibitor to retard future growth. Once the decking has been thoroughly cleaned, you will need to maintain it in much the same way you would adhere to a cleaning schedule for any other significant item in or around your home. What products do you recommended for removing mold from a deck? When used in combination, these two products provide a “one-two” punch to help control mold and mildew. Both are heavy duty, mildly alkaline, chlorinated mold and mildew removers/cleaners that are biodegradable once rinsed into the soil. Both have been tested and perform very well in removing mold and mildew and retarding its return on our uncapped composite decking. Consumers can find these products on the manufacturer’s website, at most Home Depot® locations, and through www.homedepot.com. They are also available at most Walmart® stores and Ace® Hardware locations. Can I power-wash my deck if there is mold present? No. Power-washing will only worsen the mold problem. The pressure of the power washer actually pushes the mold further down into the pores of the material. We DO NOT recommend power washing the decking while mold or mildew is present. If a pressure washer has been used, we recommend at least two applications of cleaner to ensure that the roots of the mold are thoroughly neutralized. A pressure washer can also, if used improperly, damage the deck surface. We recommend exercising extreme caution when using a pressure washer for deck cleaning. Remember to keep the tip at least 12 inches from the deck surface to prevent damage. What makes one Fiberon deck board different from the others? We organize our decking lines into Good/Better/Best categories. Every Fiberon deck board offers lasting durability, easy maintenance, and a great warranty. The big differences come down to the aesthetics (the color, streaking, and grain patterns); the cap layer (the protective cover that provides stain and fade resistance, among other things); and the price. Watch this short video which explains the unique properties of each line. Can I install Fiberon decking with another manufacturer’s hidden deck fasteners? Only Fiberon Phantom hidden deck fasteners are recommended for use when installing Fiberon decking. (Note: hidden fasteners will only work with grooved edge boards, not square end boards.) Using another manufacturer’s product will void your warranty, and may result in an unsatisfactory installation. Trex Universal Clips, for example, do not hold the boards securely during thermal expansion and contraction caused by temperature swings. Consequently, you could experience significant end-gapping issues. Always read and follow Fiberon decking installation instructions to ensure correct installation and keep your warranty coverage intact. What is picture-framing a deck? “Picture-framing” refers to putting a border around the edge of a deck or porch. On a composite deck or porch, picture frames are constructed using square-edge boards and mitered corners to ensure a clean, finished look. It heightens visual interest. Most contractors will use one color for the deck’s interior and then a contrasting shade for the picture frame. This enhances the custom look of the space and creates a border that really pops. It creates a polished look. Framing with a square-edge board will cover the exposed ends of interior boards as well as hide the edge on grooved decking that is used with hidden fastening systems. It highlights deck stairs and edges, visually reminding guests to watch their footing. That’s a smart, easy way to enhance safety on your space. One thing to consider: Darker picture frames are easier to see during the day; however, lighter picture frames are often easier to discern in the evening – especially if you don’t have riser lights on stairs. Picture-framing is also effective for defining specific zones on your deck, such as the dining area, as well as highlighting special features like a fire pit. One final tip: Be sure that the width of the picture frame is in correct proportion to the size of the overall deck. If you’re working with a large space, you may want to create a wider, two-board-width picture frame. If the deck is smaller, stick to one board width. Can Fiberon Decking be installed over existing joists and framing? There must be adequate cross ventilation and unobstructed airflow under 50% of the deck. Allow a minimum of 1.5 inches (4 cm) between bottom of joist and the ground. Water must be able to flow away from under the deck. Improve drainage or grade flat areas where standing water may gather, and do not install decking directly to an existing or solid surface. Can Fiberon products be used for any part of the decking substructure, frame or joists? Fiberon composite decking has many outstanding qualities; however, it is simply too flexible for use as a structural component of a deck. When installing Fiberon decking, please follow all installation guidelines and local building codes. How do I replace a deck board? 1. Make two parallel cuts down the center of the board to be replaced. Remove the center section from the board (fig.1). 2. Remove the remaining two pieces from the tabs of the corresponding hidden fasteners. 3. With a reciprocating saw, remove the tabs on the fasteners which have the screw showing (fig. 1a). 4. Position the new deck board onto the remaining tabs (fig. 2). 5. Ensuring a consistent 3/16” gap between boards, predrill a 1/8” hole along the unfastened edge at every support joist. 6. Secure the board by fastening a #10 x 2-1/4” long stainless steel deck screw in each pre-drilled hole. What are fascia and riser boards and how do I install them? Fascia and riser boards are thinner and wider versions of deck boards that serve as a non-structural covering for rim joists, stair risers, and stringers. They are sometimes referred to as “skirts” or “trim” boards. Because fascia and riser boards are thin, Fiberon recommends installing them using 2.5" #8 or #10 stainless steel or composite screws installed flush to the board surface. We do NOT recommend using Cortex face fasteners because there is simply not enough material available for the screw to be properly seated. Fascia: Install screws at a maximum 12-inch interval, with three screws across the face at each interval. Risers: Install screws at a maximum of 12-inch interval, with two screws across the face at each interval. In addition, when installing Paramount PVC fascia, apply a zigzag bead of high-quality exterior adhesive to the entire length of the back (the smooth side). Be sure the adhesive is applied within 2 inches of the edges and ends. Do not over-tighten screws. Buckling or cracking could result. Do not install screws within 1.5 inches of board end or within 1 inch of board side as immediate or eventual cracking could result. When installing in temperatures of 50°F (10°C) of higher, install with 1/8 inch (3mm) spacing between the edges and ends. For temperatures below 50°F (10°C), install with 3/16 inch (5mm) spacing between edges and ends. Does Fiberon provide a complete rain screen system solution? Fiberon offers a durable composite cladding that provides an elegant wood-like façade for a rain screen application. Cladding is only one component within a rain screen system. Other elements include: weather-resistive barrier (rated for continuous UV exposure), furring material, and flashing at all penetration points and cladding transitions. Note that the air gap between the weather-resistive barrier and exterior cladding can be as narrow as 3/8.” This will still enable drainage and drying. Where can I find Fiberon cladding? Like all Fiberon products, the cladding is available through a wide network of Fiberon distributors and dealers. Use our “Where to Buy” tool to locate the Fiberon dealer nearest to you. Want to see a sample first? Here’s how to order. Why would I choose a decking product for a cladding application? Fiberon composite boards have been tested and trusted by contractors for years. They have been designed and manufactured to withstand the rigors of regular foot traffic without sacrificing appearance or performance, so you can feel confident when specifying them for cladding projects. Plus, unlike ordinary cladding options, Fiberon composite cladding won’t peel, split, crack, or rot. It’s dimensionally stable, easy to install, and deflects only negligible amounts of water – unlike brick or stucco, which absorb water quite readily. How do I install Fiberon cladding? What are the differences between Symmetry and Horizon? Both collections feature the same PermaTech® cap layer for stain and fade resistance and durable composite construction; however, each has its own distinct look. Symmetry has a matte finish and subtle multi-tonal streaking. Offered in four earthy colors (Burnt Umber, Cinnabar, Graphite, and Warm Sienna), Symmetry delivers a rich, understated look. Horizon has a more traditional finish and dramatic multi-tonal streaking. Choose from Ipe, Rosewood, Castle Gray, and Tudor Brown. Is cladding a new product for Fiberon? No, cladding is a new application for our Symmetry and Horizon decking products, both recognized for their stunning wood-like aesthetics, lasting durability, and easy maintenance. Fiberon cladding gives architects and specifiers a beautiful, long-lasting design option that never needs re-painting, re-staining, or re-finishing – and that can mean significant savings on long-term maintenance costs. Because tree sap is especially sticky, neither ordinary deck cleaners nor power washing will work. We recommend using WD40 to remove the sap. Be sure to follow all manufacturer’s instructions carefully. Please note that WD40 also is effective in removing the labels that are found on the boards when they arrive at the job site. How much gap should I leave for expansion or contraction when installing? As temperatures fluctuate, composite deck boards will naturally experience thermal expansion and contraction. That’s why the board ends should never be installed tight against one another. There should always be a slight gap. How much of a gap? That will depend upon air temperature at the time of installation (Read this to learn more). For areas that are subject to significant temperature swings, we recommend installing your deck boards using surface fasteners. First, ensure that the deck boards are aligned properly. Then, install a fastener in the middle of each board length to prevent shifting during thermal expansion and contraction. Can I use hidden fasteners on Paramount decking? Paramount Decking is available in both square edge and grooved deck boards. The following are approved fastening systems for Paramount Decking, a capped cellular PVC deck board. Fiberon Cortex Screws are the only approved hidden face fasteners recommended for Paramount decking. 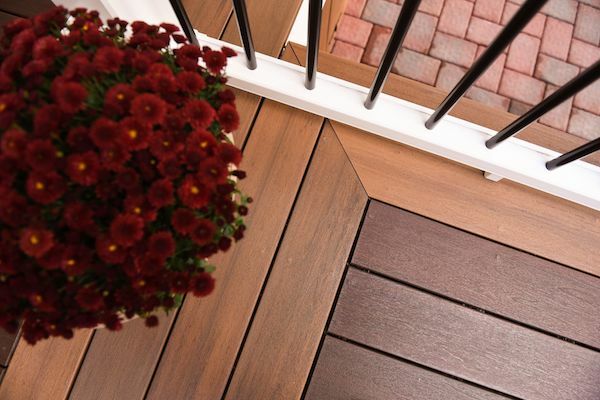 Fiberon Cortex screws are available in all colors of Paramount Decking. For non-hidden face fastener installations, approved surface fastening is accomplished with a minimum #8 x 2 ½” composite deck screw with an ACQ corrosion-resistant coating or stainless steel. For all face fastening installations, install perpendicular to the deck surface, not at an angle. Position screws no closer than 1/2" from board edges or board ends, using two screws in every joist. Fiberon recommends the Tiger Claw TC-G® hidden fastener in combination with Fiberon Cortex Fasteners as the only approved system for installing hidden fasteners in grooved Fiberon Paramount deck boards. The TC-G side hidden fastener installed with an impact-driver creates a tighter connection to the joist, alleviating potential sound caused by the boards moving against the joist. Maximum residential joist spacing is 16” on-center for perpendicular-to-joist applications. With all side hidden fasteners, use a minimum of one Cortex surface hidden fastener positioned in the center of each board to mitigate potential sound and to ensure the boards stay positioned during normal thermal expansion and contraction of the deck boards. Spacing the deck joists at 12’” on-center will increase stiffness and mitigate sound potential. Maximum residential joist spacing is 16” on-center for perpendicular-to-joist applications. Self-adhesive Joist Tape: Regardless of the method of fastening, using self-adhesive joist tape will help reduce potential sound caused by boards moving against the joist, and is designed to protect the joists from premature weather-related deterioration. See the technical bulletin for installation instructions for Paramount grooved decking. We recommend colorfast woven mats or polypropylene mats on Paramount Decking. Avoid the use of rubber, latex or vinyl products on Paramount Decking, as a reaction could occur resulting in discoloration under the rubber, latex or vinyl product. For general cleaning, use soap and water or mild household cleaners such as Simple Green, Krud Kutter Cleaner Degreaser. Follow the manufacturer's instructions and test in an inconspicuous area to make sure cleaner does not harm the decking surface. ​How does “micro-texturing” improve the look of Symmetry Decking? Micro-texturing adds a realistic wood grain feel and look, providing the character of straight and tight grain patterns of flat sawn hardwoods. ​How do I clean Symmetry Decking? ​Why don’t I see a repeating pattern on Symmetry boards like I do with some other decking? Symmetry Decking is manufactured to have more random, natural graining than you’ll find with other deck boards. There are no visible repeats or easy-to-discern patterns. I accidentally chipped a piece of my Horizon deck board. Can I repair it? While Fiberon decking is resilient, some outside sources can damage it. Certain minor issues can be fixed with a brass bristle brush or heat gun. Or, since Horizon Decking and Symmetry Decking are reversible, you may opt to remove the chipped board, flip it over, and re-install it. If you’re not sure what the best course of action is for your particular situation, we recommend contacting our Technical Services staff via email. Please enclose a photo of the damaged board, along with a note explaining what happened. Our email address is [email protected]. We look forward to helping you. What is the difference between Sanctuary Decking and Horizon Decking? Both the colors and grain patterns are different. Plus, Sanctuary is a three-sided capped board, whereas Horizon is capped on four sides and is reversible. How do I clean Sanctuary Decking? What’s the difference between original Good Life Decking and new Multi-Chromatic Good Life Decking? Original Good Life Decking in Cabin and Cottage resemble traditional painted deck boards. The colors are mono-chromatic, solid shades. New Multi-Chromatic Good Life Decking features subtle and dramatic streaks of color, giving the boards a look that mimics tropical hardwoods. All four colors have the same protective outer layer on three sides, the same solid composite core, and the same warranty coverage. What type of surface fasteners are recommended for Good Life Decking? We recommend 2.5-inch #8 or #10 stainless steel or composite screws for surface-fastening Good Life Decking. Do not use Cortex fasteners, or any other fastener with a plug. Here’s why: Good Life Decking has a scalloped bottom. The scallops are located on the underside of where you would insert the screw. Because those areas are naturally thinner, the screw does not have sufficient material to grab. This results in a less secure installation and a far greater risk of cracking over time due to pressure/vibrations. What makes Good Life Decking different from your other decking lines? Good Life Decking has a scalloped bottom. All our other deck boards have a flat bottoms. The scalloped design requires less decking material. Consequently, the boards are priced comparably to pressure-treated lumber – making this a smart choice when budget is a top consideration. Like our other decking lines, Good Life is available in multi-chromatic and solid colors. There’s a durable cap layer for stain and fade resistance, and solid composite construction to prevent splintering, cracking, insect infestation, and decay. One more note: Good Life Decking does not work with Cortex hidden face fasteners. Use composite deck screws for Good Life square-edge boards and Fiberon Phantom fasteners for grooved-edge boards. How do I clean Good Life Decking? Does Fiberon ArmorGuard fade or stain? ArmorGuard is warranted for 20 years against fading and staining. See the 20-Year Stain and Fade Limited Warranty for complete details. What sizes and lengths are available? Fiberon ArmorGuard Deck boards are .093 in. x 5.25 in. Grooved(for hidden fastening) deck boards are available in 12, 16 and 20 ft. lengths. Square edge deck boards (for picture framing, stair treads and risers) are available in 8 and 20 ft. lengths. ArmorGuard Fascia boards are .75 in. x 11.25 in. and available in 8 and 12 ft. lengths. Subtly streaked color tones that emulate real hardwoods, Fiberon ArmorGuard Decking comes in four colors; Brazilian Walnut, Nantucket Gray, Coastal Cedar and Seaside Gray. What is the difference between ArmorGuard Decking and Horizon Decking? ArmorGuard Decking is covered on three sides with PermaTech and has a scalloped bottom. ArmorGuard has more subtle colour streaking versus the more dramatic colour streaking of Horizon Decking. Horizon is covered with PermaTech on four sides and is a reversible board. How do I clean ArmorGuard Decking? Can I order Symmetry Railing online? Yes, you can order Symmetry Railing directly from our website. Shipping is free on all orders greater than $749, and the railing will be sent directly to your home or job site. Shop now. How do I remove a damaged deck board that was installed with Phantom hidden fasteners? 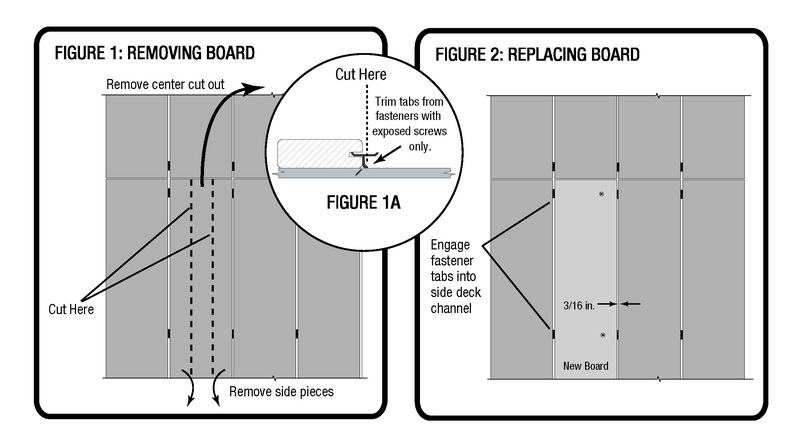 If a board is damaged and needs replacing, the method for removal will vary by fastener style. For Phantom Universal fasteners, simply reverse out the screw to remove the fastener, lift out the damaged board, replace with a new board, and re-fasten. Make two parallel cuts down the middle of the damaged board and remove the center section. Using a small pry bar, removed the two remaining decking pieces from the fastener prongs. Use pliers to remove the prongs on the sides of the board on which the screw heads are now visible. Position a new board carefully into place, and drive it onto the remaining prongs. Set the board into the proper position and secure the lead edge with a finish screw or nail. Are Fiberon fasteners compatible with other decking brands? Fiberon Phantom universal plastic hidden fasteners are compatible with most leading decking brands. All other Fiberon fasteners are designed specifically for use with Fiberon decking products. In fact, using a non-approved fastener will void your warranty, so ensure you are using the right fastener prior to beginning your deck project. What is the difference between Phantom Universal Hidden Fasteners and Phantom GT Hidden Fasteners? Fiberon Phantom universal Fasteners are high-quality HDPE material with a carbon steel-coated screw that has been pre-inserted for faster, easier installations. The Phantom universal fastener provides superior lateral movement control when tested against the leading competitor’s plastic fastener. It installs with one touch and ensures consistent 3/16” gapping between boards. Plus, plastic fasteners are less expensive to manufacture than metal fasteners, so the cost savings is passed along to the customer. The Fiberon Phantom GT Hidden Fastener is made from stainless steel with a corrosion-resistant coating. It has more “teeth” and dual limiting tabs to ensure consistent board spacing and eliminate the twisting that often occurs with single tab fasteners. The Phantom GT fastener is a good choice for contractors and DIYers who prefer a traditional metal fastener. How many hidden deck fasteners will I need for my specific deck size? Use the following chart to determine the number of Fiberon Phantom Universal or Phantom GT Hidden Fasteners you will need for these popular deck sizes. Can Fiberon deck boards or fence pickets be stained or painted? Fiberon decking and fencing is made from long-lasting, low-maintenance composite materials that never need staining or painting. In fact, paints and stains do not perform well on these durable surfaces. They will tend to peel off unevenly and require frequent touch-ups or reapplication. How do I make 22- and 45-degree turns? These turns cannot be made off of one post. If an angle turn is required, an additional post must be installed at the angle required. Is it OK to run a decorative piece along the top of the pickets? It is not recommended to add anything to a fence section that will add weight to the fence. Can the panels be cut down to make them less wide? Can something be run under the pickets to keep animals in or out? Screening can be run under the pickets, but must be secured to the posts only. Can I order the fencing directly from Fiberon? No, we do not sell direct. Fencing must be acquired from an authorized retailer. Fiberon Fencing is also available at Lowe's stores under the Fiberon WoodShades brand. Visit http://www.fiberonwoodshades.com/ for more information. Can the pickets be attached to metal rails? Pre-drill holes three times the shank diameter of the fastener or slightly smaller than the fastener head for middle and lower securing points. Slats should not rattle, but still be allowed proper movement once installed. What are the minimum and maximum size staples that can be used to attach the pickets? Staples should be between ¼" to ½" in crown, and between 1 ½" to 2" in length. Can silicone adhesive be used behind the pickets when stapling them to the rails? No, adhesives do not hold long-term. Can the pickets be installed horizontally? No. The pickets are designed to hang, installing horizontally would result in bowing of the material. How do I repair a picket that has broken off? A broken picket cannot be repaired, it must be replaced. How much do the pickets weigh? The Gothic pickets are 2.2 lbs., the Dog Ear pickets are 5.4 lbs., and the Square Top pickets are 7.4 lbs. each. How much space is between the pickets on the pre-built panels? The Gothic pickets are spaced at 2 3/8" apart on the pre-built panels. How do I replace a picket? Pickets installed with staples can be pried away from the rails using a putty knife or other flat object inserted between the picket and the cross rail. A new picket is then stapled in its place. Can I attach the pickets with screws or nails? Neither is approved fastening methods for the pickets. Can I put pickets on both sides of the fence when installing a traditional privacy or board on board fence? No, composite materials are too heavy to install privacy style or board on board on both sides of the fence. Only shadowbox method can be used if pickets are desired on both sides of the cross rails. Can the longer and wider 4 5/8" or 6 1/2" pickets be used with the shorter 64" posts? No, the 64" posts are only 3 ½" square so they will not support the weight of either of these pickets. Can the pickets be painted? Paint will not adhere long-term to the pickets, so it is not recommended. Can the pickets be cut, and if so, what do I use to cut them? Yes, the pickets can be cut using a minimum 32 tooth carbide-tipped saw blade. Can the pickets be installed touching the ground? No, they must be spaced at least 2" above grade to allow for expansion and to prevent the weight from causing the pickets to curl or buckle. Pickets installed on a gate must be a minimum of 4" above ground for these reasons as well as to clear grade when opened. Can I place the pickets side by side without any gapping? No, pickets will expand and contract with heat and cold so a minimum 3/16" gap is required between pickets. What type of wood is in the Fiberon fence post insert? Fiberon fence posts comprise a long-lasting, low-maintenance composite sleeve placed over a 4 inch x 4 inch wood insert. We use Port Orford Cedar (POC), the strongest cedar in the world, for our inserts. Unlike most wood species, POC is naturally resistant to weather, rot, and insects. Plus, POC does not require the use of chemical preservatives, making it an appropriate choice for an eco-minded company like Fiberon. To learn more about Fiberon’s commitment to sustainable manufacturing, read this. Can I substitute metal for the wood core? We do offer a metal-sleeved post by special order, but the solid wood insert is strong enough that it should not be necessary. Do caps come with the posts? Yes, the cap is attached. Do the posts already come with a wood core? Yes, the posts are ready to install in the ground. How do I replace a post in the middle of the fence? The fencing on both sides of the post must be unattached from the post. If possible, the post needs to be cut at ground level, then the concrete, and the buried part of the post must be dug out. Once the gravel level has been confirmed, place the new post and secure with new concrete. Can I install the posts on a deck using a surface mount? No. Due to the weight of the fencing and wind velocity, the post requires being buried a minimum of 24". Why doesn't the composite completely cover the 96" fence posts? 24" of the post is installed in the ground, so it is not necessary to extend the composite all the way to the bottom as it is not visible or exposed. What is the best method of installing posts in extremely sandy soil? Follow the recommendations for gravel in the bottom of the post holes to ensure that posts do not sink over time. How do I remove and reattach the caps? The caps can have the staples that hold them in place removed, and then be re-stapled to reattach. Can the wood be removed from the composite sleeve? The sleeve can be removed by removing the staples at the bottom of the sleeve and sliding the insert out. Do I need to apply any type of sealer to the exposed wood on the 96" posts before setting them in the ground? How do I attach the posts to existing concrete? The posts cannot be surface mounted; they must be buried in the ground to provide stability. Do the fence posts already come with a wood core? Do the rails already have wood inside them? Yes, the rails are ready to install. How do I replace a cross rail? All pickets need to be removed from the section needing the rail replacement. If the rail is face mounted, remove the picket covering the seam and unscrew the rail from the posts. If the rail is mounted with brackets, remove the screws from the rail and lift it out of the bracket. Once the rail has been replaced, reattach pickets. Do the rails twist or warp? Do the hinges come with the gate frame kit? When installing a Gothic gate, can I use a 64" post as long as I bolt all the way through the post? We provide instructions on how to fabricate a gate from the rails in the installation instructions. Can pickets go on both sides of the gate frame? No, the composite materials are too heavy. Can I substitute a different style of latch and not void the warranty? Yes, if the latch does not alter the frame. However, the latch will not be warranted. Is there a gate frame for the Gothic/Ranch style of fencing? No, we provide instructions on how to fabricate a gate from the rails in the installation instructions. How do I remove rust from my gate frame? Use rust neutralizer and then paint with a rust preventative paint.